STOP! 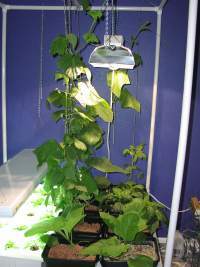 If you have just arrived at this website looking for a bubbler hydroponic system, you might want to go back to page one of this mini-farm plan. We hope you will try out our plans for this cool bucket bubbler system. You will be amazed at the size and health of your specimen plant in this unit. It provides a great introduction to hydroponics for adults and children alike, and it's just plain FUN. You might try growing heirloom tomatoes, medical herbs or even orchids. Or you might just enjoy munching on your own healthy, homegrown salad micro-greens! No matter which way your interests take you, you are sure to enjoy this clean, healthy, prolific, earth-friendly gardening method. We just love hydroponics and know you will too. ***To access a great (and free) booklet version of our Bucket Bubbler plans, click below. You can share it, store it or print it out for handy reference as you build: PDF FILE OF BUCKET BUBBLER UNIT.